If you're thinking to yourself that I seem to be on some sort of scone kick, you're right. They're a pretty versatile breakfast option, and it's easy to be creative with them and even easier to bring your ideas to fruition. I don't want to brag*, but I can bring a batch of scones together in under ten minutes**. **I think I'll time myself next time and see just how quickly I can get 'er done. The scones you see before you are my current favorites. They're a unique combination of sweet and savory, with thyme sneaking in there and disrupting everything you thought you knew about scones. I was skeptical about the apple-cheddar blend (I do not believe it's an acceptable duo for pies, but to each her own), but it works very well in this application. The nutmeg is a surprisingly enjoyable aspect as well. Combine the first six ingredients and cut in the butter until a coarse, crumbly mixture is formed. Mix in the buttermilk, apple, and cheese using a fork until everything is moistened and then turn the batter out onto a floured surface. Form the dough into two 6-inch wide disk about an inch in height. Apply an egg wash and sprinkle with thyme, then cut each disk into 6 wedges. Transfer the wedges to a baking sheet with about 2 inches between them and bake for 20-25 minutes. A fabulous combination! Those scones must taste wonderful. Now that's my kinda three-some! Sounds like a fantastic combo!!! That does sound really good! Would be lovely with a bowl of pumpkin soup. A little sweet. A little savory. Now, that's the perfect Sunday breakfast treat. I love nutmeg and the thyme I bet it gave them the perfect kick! I think my favorite types of scones are the sweet/savory variety. These toe both lines beautifully. Your CAT scones look wonderful. I do love the combo of cheddar and apple...so autumn and lovely. I'll take a basket, please. 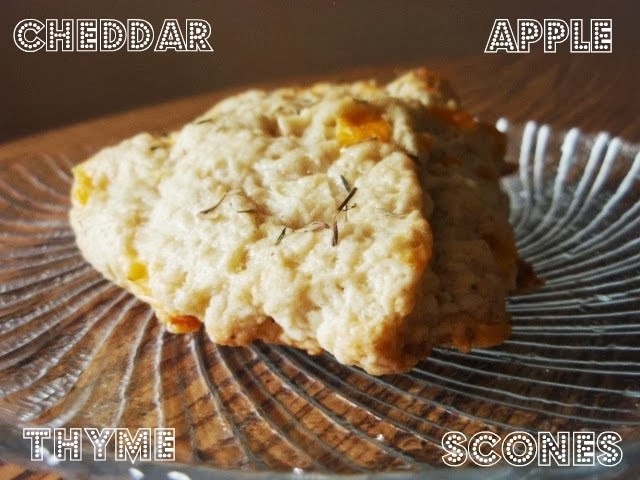 Cheddar, apple and thyme in a scone sounds simply fab! Cat scans, cat scones and threesomes! And Cheddar, apple and thyme, girl you've got it all in one post! :P BTW my mind did go there for a split second but no longer! These sound really delicious! I like the apple and cheddar together and I bet they thyme makes it even better. I will have to remember these for apple picking season! Nothing like a fresh from the oven scone, love the flavor combination you put together. Beautiful beautiful :) I am loving this combination of flavors!! I love savory scones, especially with cheddar! Oh, let's face, really, I love all scones! :-) These sound great! I LOVE this flavor combo! Pinning!